This term (third quarter) has been easier for my daughter Thea. It's all because their lessons involved subject matters with less computation compared with those in the previous terms. They are on fraction, money, and geometry. I will help her finish her project in Geometry tonight. 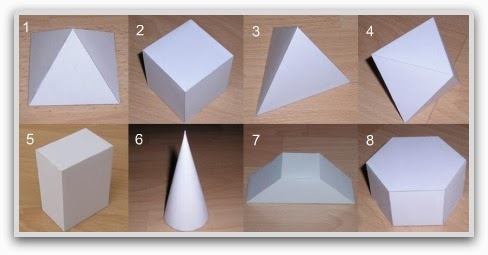 They are asked to make several space figures (3D geometrical figures) such as cube, rectangular prism, triangular prism, sphere, cylinder, and cone. Based on the instruction, they can make the figures out of cardboard or plywood. I think, cardboard is much easier. This the sample of figures I'm talking about.